We sell Titan poly deck boards and panels for lakeshore owners who simply want to replace deteriorating decking on their current dock. We have drawings for many dock brands and models, and we can also build the replacement panels for you. Titan Classic boards are available in 2', 3', 4' and 5' lengths. The boards are 1.125" deep and 12" wide. Standard colors are mushroom (light tan) or light gray. Aluminum reinforced boards can span up to 24", and non-reinforced boards can span up to 16". 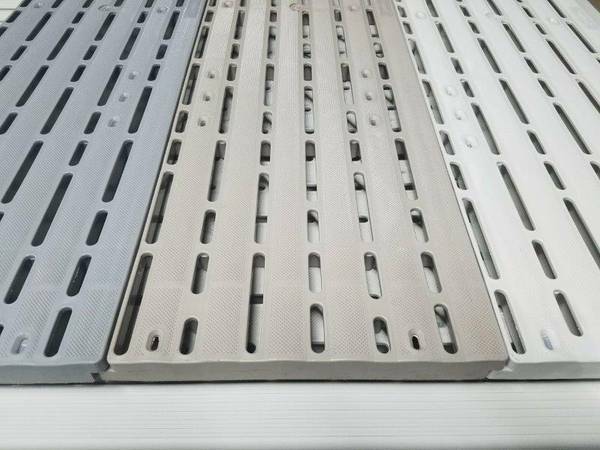 We also offer aluminum extrusions to assemble individual boards into a panel.